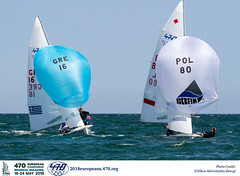 Two races were completed today in the second day of the final series in the 470 Class Junior World Championships for men/mixed and women. Sofian BOUVET and Jeremie MION (FRA) strengthen their lead in the men’s 470, whilst Tara PACHECO and Berta BETANZOS (ESP) maintain their lead, but weaken their position with an OCS in the women’s. Luca DUBBİNİ and Roberto DUBBİNİ (ITA) fought their way back into a second place for Friday’s racing by scoring a second and tenth place in race nine and ten respectively. Sebastian PERI BRUSA and Santiago MASSERONI (ARG) climbed behind the overall leaders from France in second place yesterday, although both crews have now lost the connection with the french team of Sofian BOUVET and Jeremie MION who secured, and even strengthened their leading position. The French lead with a 33 points difference on the Dubbinis. “The wind was even lighter than the previous days, and also more challenging because there was more difference in local wind conditions around the race course. The wind was also very shifty and it was difficult to see shifts coming, so now and then we just had to go with other boats. In the beginning of the first race we felt that we were not having a good boat speed, but we worked hard and finally we found it. We were going very fast.” BOUVET said. Although the French men have taken a convenient lead already, they remain alert to their opponents. “The guys from Argentina had an OCS today, and that takes away a little of our worries because we also had an OCS before.” BOUVET concluded. Although it will be very hard for anyone to push the French from their throne, the race for silver and bronze is still open, with a only a 10 points difference separating the teams ranked number two through eight. The women’s top 5 has returned to a similar situation from two days ago, however points and discards show a totally new situation. 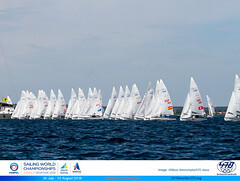 Tara PACHECO and Berta BETANZOS (ESP) still lead the women’s fleet despite scoring an OCS in race nine. Although they can still discard this result, it narrows their margin. Annika BOCHMAN and Anika LORENZ (GER) only added four points today to their overall score, to claim back their third overall position and start Friday’s last two races before the medal race only 15 points away from PACHECO and BETANZOS. BOCHMAN and LORENZ still have a margin to if necessary allow themselves a disqualification to be discarded as worst result. Both crews will be very much aware that the Spanish team lost this margin today. 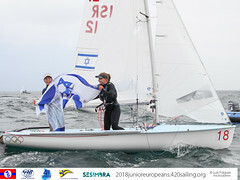 Gil COHEN and Dana Mamriev from Israel, who are here sailing their first 470 Junior Championship, did very well during the whole event. By scoring a fifth and tenth place today, the the distance to the leading German crews BOCHMAN and LORENZ and Victoria JURCZOK and Josephine BACH has come dangerously close. Tina LUTZ and Susann BEUCKE (GER) scored a bullet in the first race today, but fall back by scoring nine points in the second race. Their results however are enough to climb back into fifth position and fill the women’s top five with three German crews. Tina LUTZ wrote history in youth sailing by reigning over the girls at the Optimist World Championship of 2003 and 2004, to finally win the overall Optimist Worlds of 2005. LUTZ teamed up with Susann BEUCKE and success came quite quickly in the 420 class, by winning the Ladies’ 420 Junior Europeans in 2007. Although both girls would like to put more efforts into their sailing career, the over 1000km distance from the places where they live, Munich and Kiel, and their education, currently keeps them from doing so. “The first day was great. There was quite some more wind. We have light winds now every day and for us it’s a bit tricky. We are not good in light winds and so we’ll have to train.” LUTZ said. “I also think that in such conditions start and boat handling must be perfect. For the first time in this event we had a good start and all good things came together, and as you see, we have a first place in today’s first race. In the second race, we had a bad start and tried our best, but it just didn’t work as good as in the first race.It’s not only important to win or to be good. The most important thing is to learn.” Susann BEUCKE added. Racing continues on Friday 17 June.